On the street where I live, the lights are up! Across the way, huge inflated Dio De Los Muertos heads cover the yard; my neighbors have loaded up their porch with dummies splashed in red paint, or with heads replaced by those of chickens and bulls. My best friend and I proudly stood back from the spider web that we accomplished after watching how to do it on YouTube, and a human skeleton prepares to light the way of trick-or-treaters tomorrow night, as it walks its skeleton dog. I love Halloween! I love the cool weather, the rustling leaves, the decorations and celebrations. 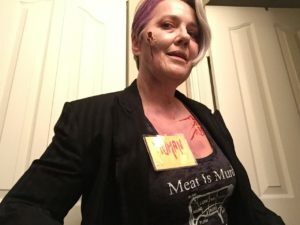 The opportunity to dress as one’s alter ego (two years ago, I was a zombie!). The binge-watching of Scarier Things and Fargo. It’s thrilling. It’s scary! What’s not to love?! Appreciate, if you will, that as a psychotherapist I treat anxiety. The constant, chronic fearfulness that interrupts our ability to live more freely and easily in the world, that keeps us from befriending, or ending bad friendships, keeps us from ending the jobs that no longer serve after we’ve prepared for and stepped into the careers that sing to our hearts. And that, most of all, keep us from delving deeply into the grand mystery of ourselves. So why would I love this season of intended scariness? Why would I encourage you in the joy of “boo”? Because practicing a little frisson of fear, from time to time and in good company, inoculates us from that very anxiety. Think of it as exercise: when we lift weights or run, we don’t hold up the weight endlessly or run until we hurt something (unless we’re foolish). No. We do reps. We do laps. We rest between, and recover. In that way, we build strength without becoming overwhelmed, without injuring ourselves. The scary moment in the movie is followed by a funny one, gets resolved at the end. The scary halloween house is visited and then left, as your children turn towards you for assurance and find it. Fear, unlike anxiety, is based in the present, and the conditions inciting it can therefore be managed, giving us a sense of confidence around scary sensations that can be expanded to those selfsame anxious sensations. The breath we automatically take after the monster is vanquished, the laughter when the loud noise turns out to be a cat, the shiver of delight are all, also, forms of discharge, teaching our nervous systems to handle fear and anxiety more effectively. Stephen King once suggested that we watch and read horror not to exorcise fear but to exercise it, and I agree. Further, he encouraged us to consider the possibility of stepping into the role of the monster, of being the cause of the terror and not the recipient, hero or victim. I love this suggestion! We all have our inner monsters, the parts of us we’re ashamed of, that terrify us with their dark suggestions and cruel judgements. In my work, parts like this often show up, and the treatment is paradoxical: bring these ugly manifestations of ourselves closer. Understand them, even dialogue with them, get some negotiation going. By willingly, and in a controlled environment, stepping into an aspect of our inner life that terrifies us, we begin the reownership of the power that lies within that part. The odd thing is, that when you do so, when you, in the words of a friend of mine, “offer the monster a cookie,” you take away some of the terror you find at stepping into your self. This Halloween, delight in the scary, embrace its temporary nature and also the lovely sigh of relief at its end. 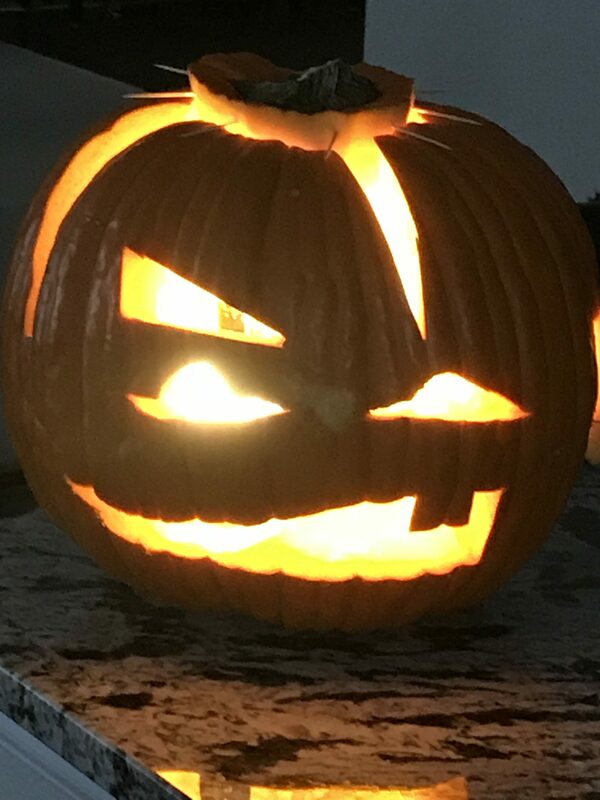 And have a BOO-tiful time!